Is it Good? 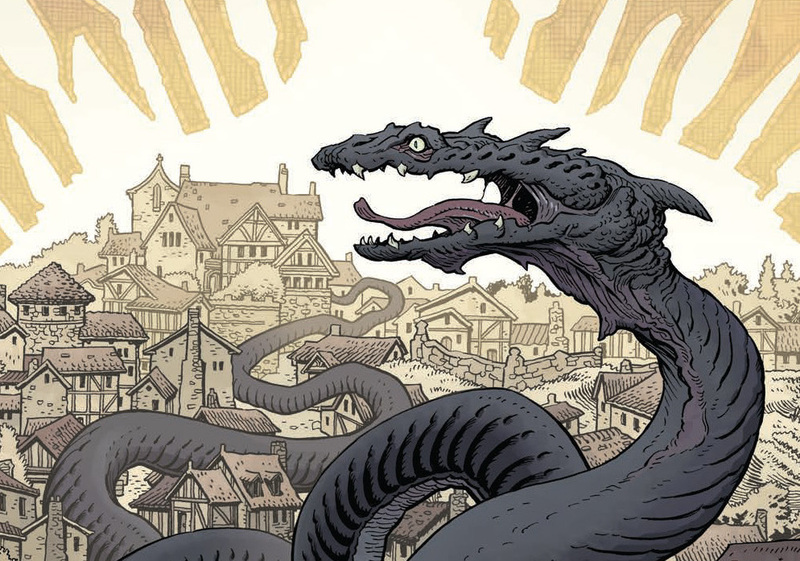 The Storyteller: Dragons #2 Review – AiPT! When you think of dragons you think flying fire breathing monsters that are as big as a house. If you’re a fantasy fan you know the great worm can come in many forms and last month BOOM! Studios showed us a brand new type with horns! What is in store for issue #2, is it good? BOOM! Studios states . . .
Nathan Pride tells the tale of “The Worm of Lambton.” A young heir to a kingdom catches a horrid Worm while fishing on the banks of the River Wear and throws it into a well in disgust. When the Worm outgrows the well and begins to torment the nearby villagers, the heir will have to return to stop it. Why does this book matter? Nathan Pride writes and draws this one in a classic dragon/medieval times setting, which makes it feel familiar and rich right off the bat. He also interweaves the Crusades into the narrative and that helps make the story feel a bit more real. The townsfolk and setting are very simple and Pride does a good job with the environment, costumes and setting visually. The most important aspect to a series like this is nailing down the dragon and Pride does so. The dragon is definitely not the cliched version, but more of a creepy river monster that’s more worm than flying creature. It’s not overly snakelike though and its long bill is creepy as heck. Pride lets it loose, with plenty of munching on farm animals to be had. Plus Pride adds in some historical value with tapestries of the dragon which helps bring the story back to the timeline. This creature is becoming famous, which helps increase the stakes for the protagonist who’s off at the Crusades becoming a man. The art style is in the vein of a cartoonist and in a lot of ways reminds me of Stan Sakai’s work on Usagi Yojimbo. Pride uses the tapestry element to help tell the story well and while simple on the surface, they look great. When the Storyteller shows up with his dog these scenes work nicely as Pride matches the look of the character from the TV show quite well. The art style doesn’t do its best work with the witch, who’s rather normal looking. The big action sequence at the end is blocked so that we see blood splatter but not much on page. In a way it’s reminiscent of a children’s book which is fine and good, but as a climactic battle it suffers. The final moments don’t work too well either. I don’t want to spoil things, but our protagonist makes a choice that will affect his bloodline for generations. It feels stuffed in and not necessary and this might be due to the weak witch character inserted in. This works very well as a dragon story, but the witch and her ultimate curse doesn’t work. This ultimately makes the entire read a little slow when all we want is that dragon action. A fantastical dragon that’s unique and creepy will satiate fantasy fans. The story doesn’t quite work when it adds a witch, which slows things down too much.